GaryMoller.com - Health, Fitness - Naturally! : So; sore muscles are good for you! So; sore muscles are good for you! "The good soreness that makes you stronger is called DOMS (Delayed Onset Muscle Soreness) and is caused by microscopic tears in your muscle fibers. It is not caused by lactic acid buildup. When muscles are damaged, they produce healing prostaglandins that cause muscles to become bigger and stronger than before they were exercised vigorously". So, DOMS is "good soreness! This is rubbish. DOMS is not good for you. For a start, the damage to healthy cells which you feel as pain, swelling and stiffness (DOMS), releases massive amounts of cell debris into the body. This debris is toxic to healthy cells, principally because it is rich with oxidants that damage the healthy tissue that is already depleted and exhausted following the workout. Flooding the body with oxidising toxins accelerates the ageing processes. 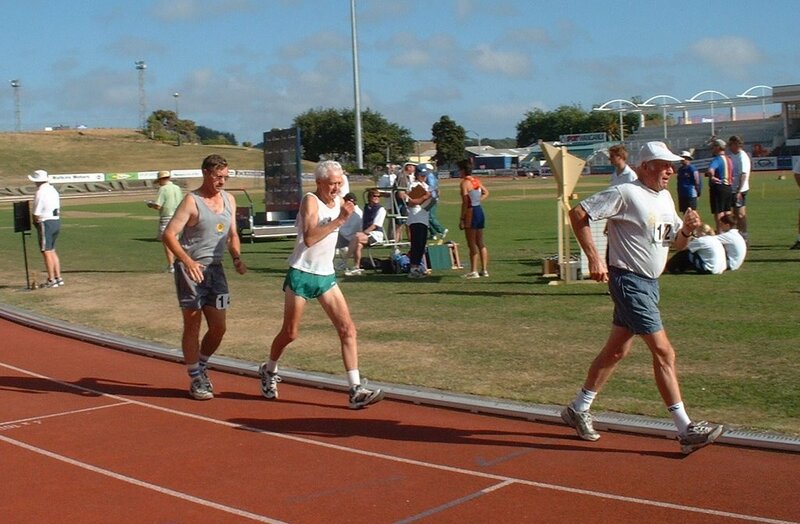 This might be why excessive exercisers do not live as long as those who exercise moderately. Recovery from exercise that causes DOMS takes from 2-5 days and further vigorous exercise within that period will delay recovery and may even lead to complete breakdown in the form of an injury or infection. A further problem with doing too much exercise that causes DOMS is the steady loss of flexibility. As any long distance runner will ably demonstrate, the steady loss of flexibility causes the eventual grinding to a halt with passing years. This is because the repair process always has the damaged tiisue shorten and harden a little each time. Again, any runner will tell you that attempts at maintaining flexibility by stretching is painful futility. In fact, most runners give up, other than during token spells such as during injury time! Take several people off the street and have them walk as fast as they can up the stairwell to the top of the tallest building you can get access to. Have them come down in the lift. Take another group and take them to the top of the building and have them walk quickly to the bottom. Contact them 2 days later and have them rate 0-10 any DOMS. What you should discover is the group that walked up will report little or no DOMS than the other who will probably report being semi-crippled and this will last several days! This demonstrates that not all exercise is the same; despite the walking down was far less strenuous, the strenuous walking up was far less damaging to the body. Furthermore, the down walkers, have significant losses of leg flexibility and this loss is lasting. Exercise that has the muscles actively resisting being lengthened (eccentric contractions) causes DOMS; whereas exercise that has the muscles actively shortening (concentric contractions) only has little or no DOMS. Activities that have high amounts of eccentric include: running, lifting and lowering weights, jumping and lunging. Activities that do not have much eccentric work include: swimming, paddling, cycling, pushing hydraulic exercise machines and walking on the flat. Try cycling for example: With no preparation, go ride for as long and as hard as you can. The chances are you will have a really sore bum from the seat, a stiff neck and sore hands from a poor bike setup; but your thighs which you thrashed to a standstill will only be mildly sore and tired the following day. By day 2-3 you will be easily able to repeat the workout. Now, I would never suggest that you attempt the equivalent with eccentric-soaked running, would I? Not all exercise is the same and don't believe everything the experts say. Finally, if you want to slow the ageing process and to be physically active well into old age, I advise you to choose your exercises with care. I have just walked up and down some serious mountains in the Tararua Ranges for three days carrying a 18 kg pack. I read your article before I left and was determined to put into practice your advice on exercising – not over-exercising and risking serious DOMS. This turned out to be an impossibility simply because the terrain to be covered 1000 + metre ascents and descents each day in windy, rainy and exposed ridge top situations. The loop route meant no shortening or cutting back in any way was possible. The final day turned into a 13 hour walk, finishing at around 10pm in cold, windy and rainy conditions. While I ‘hit the wall’ mentally my limbs and lungs carried me through. Today, the day after, I woke up a little stiff but soon freed up with movement. Tomorrow I know I will feel the same but on Friday the stiffness will have subsided significantly and I will be ready for serious exercise again. At 60, this is pretty much the pattern I have followed about four times a year. Apart from this each week I run for one hour and walk daily for about 35 minutes, wearing a 5 – 10 kg pack. Just now knees, ankles, hips, back, lungs and heart do not seem to have been adversely affected by the strenuous tramping trips. I would like to think I will sensibly cut back as the years progress. The exhilaration and the sense of achievement far outweighs the temporary discomfort felt in the two days following the tramping. I think I would be more concerned about the damaging affects DOMS brings if my exertions were more often. I know the area well and have suffered much on similar trips! There is no letup and the gnarly ascents and descents are punishing to say the least. What you have going for you is years of experience and undoubted tricks of the trade. These would minimise the damage to joints and muscles, as compared to a less experienced and less physically hardened campaigner. Tramping over the terrain you covered is hard on the joints but not too bad on the muscles. In fact, the clambering up and down the rocks and roots stretches and extends the muscles of the hips and legs and sure maintains strength and agility that are lost by most as age progresses. So keep it up Dale! My advice is to keep doing your tramps regularly - not infrequently - while taking account that age might require a slight backing off on the immensity of the trips. Stretch daily, since this is affected by age and exercise. I recommend taking some joint food before and after these trips becasue there is inevitable irritation of the joints, especially the knees and you must ensure that there is no development of arthritis. I would also recommend a multi mineral to keep the muscles and the rest of the body in robust condition. This article is rubbish and makes no sense. If you are walking up stairs, you will experience more muscle strain than if you are walking down them. That's physics. Please read the article again and then run up to the top of a very high multistorey building and then take the lift down. Then see how you are the following day. Then take the lift to the top and run down and see how you feel the next day.